Find hotel near Sao Jose Liberto And Muse .. The St. Joseph Liberto was first a convent (1749), but afterwards adopted many other roles – ammunitions magazine, barracks, hospital and prison. In 2002, though, it was reopened as a gem museum. You’ll find here today the Polo Jeweller and Artisan House and the Para Gems Museum. 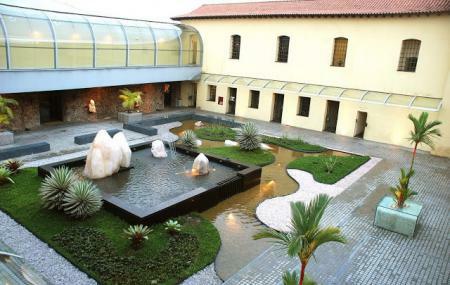 The museum has about 4000 pieces, exhibited over 5 rooms, which also explore the history and tradition of jewellery in the Amazonian Para. It also organises events and exhibitions. Also worth seeing on site are the Memorial of Cela, the Liberty Garden, St. Joseph Chapel, and the Colosseum Amphitheater of Arts. How popular is Sao Jose Liberto And Museu Gemas Do Para? People normally club together Museu Paraense Emilio Goeldi and Teatro Da Paz while planning their visit to Sao Jose Liberto And Museu Gemas Do Para. A deception, you can hardly call it a handy craft fair, very little shops and stands. No fun at all except for some decoration. Overpriced. Great place to buy Belém style art. Had my wedding rings made here. I enjoyed the history, but wish I had been able to take more picture. beautiful e exotic. jewellery with nature influence and a lot of handicraft. It was an old prison and had a memorial inside one jail cell. The best place to buy jewellery in Brazil. Nice price and great design.